The key to reliable ad hoc wireless networking for building automation applications and protocols is an Autonomic mesh network: an Autonomic network is one that self-configures, self-heals, self-regulates, and understands when to apply these parameters. Wireless technology for building automation applications has developed rapidly and commodity radio technology has helped accelerate adoption. Wireless technology provides the benefits of wire replacement for reduced deployment and maintenance costs; increased scalability; and has enabled application development. As pointed out by Helmut Macht, chief technology officer for Siemens Building Technologies Group, "The innovations in wireless communication allow more and more wired communication to be replaced." 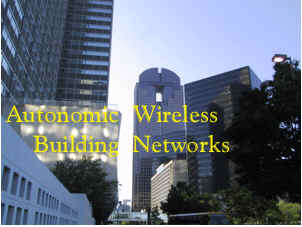 In addition, wireless is an enabler for many hard-to-reach or hard-to-wire applications typically found in large old buildings, museums, factory floors, and remote job sites; and also in rapidly developing countries like China and India where the cost of wiring anything (labor, routes through old neighborhoods, etc.) is just about cost-prohibitive. In-building wireless transmission is complex and often problematic, where a number of conditions such as multipath interference, transmission collisions, and obstructions adversely impact the reliability and scalability for large building and data throughput of high bandwidth communications. In addition, the vast majority of building automation higher-level applications and protocols (such as BACnet) were initially designed to run on wired networks, and thus require considerable technology adaptation for wireless implementation. Finally, in order to ensure widespread adoption, the wireless modules deployed must fit into the cost constraints of the building automation industry. In the remainder of this paper, we examine the emerging mesh networking and "Autonomic" technology that will make wireless building automation a reality in the very near future. In-building RF signal propagation is complex and often uncontrollable, considering the multitude of signal obstruction from concrete fiberboard walls, doors, aluminum siding, pipes, rebar, elevator shafts, electrical wiring, microwave ovens, cordless phones, Wi-Fi hotspots, rotating machinery, people, and other obstacles that offer varying degrees of attenuation and interference. All these issues cause the RF radiation pattern to be irregular and unpredictable, attenuating higher-level application and broadband quality of service. Another main problem encountered with indoor radio wave propagation is multipath interference. Multipath occurs when two or more transmission paths exist due to reflection off the walls or internal objects, or movement of objects (like door open/closure or human movement) in the path of the transmitter and receiver, which introduces random variations of received signal amplitude. In addition to signal loss, "shadows" can be created easily, and signals arriving through multiple paths may partially or totally cancel at the receiver, giving rise to the phenomenon of "multipath fading". In this harsh and dynamic environment, the traditional point-to-point or hub-based wireless network architecture is no longer capable or cost-effective. In-building wireless applications demand some sort of ad hoc and self-configuring connectivity. Ad hoc networking is the creation of a dynamic network by the wireless devices, as needed, for their communication purposes. A packet can travel beyond a RF device's radio range by multiple hops over other RF devices. Ad hoc network architecture can be tree-like, hierarchical, or a general mesh network. The key to reliable ad hoc wireless networking for building automation applications and protocols is an Autonomic mesh network: an Autonomic network is one that self-configures, self-heals, self-regulates, and understands when to apply these parameters. Autonomic networks also contain security, fault tolerance, and appropriate quality of service (QoS) to reliably support any higher level and broadband application. Mesh network architecture with multihop routing capability extends the reach of signals well beyond a single hop of RF range, allowing the RF signals to reach the very far ends of a single floor, and to cross multiple concrete floors. No line-of-sight between the transmitter and the receiver is necessary. Even more importantly, a proper mesh network structure ensures alternate data routes to be established so that a data route can switch from the failed one to a working one rapidly without losing user data. An Autonomic mesh network with multihop and rapid alternate routing capability is key to countering multipath and interference problems, allowing the data path to adapt to the changing environment dynamically and rapidly. In combinations with proper provisioning of radios, mesh architecture eliminates the time varying "shadows" in the network, thus enhancing the reliability of the network. 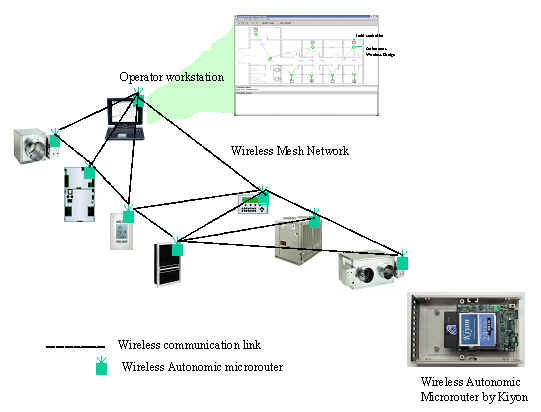 Figure 1 illustrates an example of Autonomic mesh networking applied to building automation. This capability can be implemented by use of a low-cost wireless 802.11 a/b/g Autonomic microrouter from Kiyon, Inc. The microrouter can be a standalone device, or embedded in a field controller, HVAC, etc. For example, for a MS/TP BACnet network, each microrouter will interface to the BACnet device via a standard RS-485 connector and the bridging functionality will be completely transparent to the BACnet layer and applications utilizing the BACnet network (and will provide interoperability between different company's devices). Similarly, for an Ethernet BACnet network, each microrouter will interface to the BACnet controller via an Ethernet RJ-11 connector and the bridging functionality will be completely transparent to the BACnet layer and application. Furthermore, the multiple tiers of a BACnet network (e.g. BACnet over Ethernet, ARCNET, or MS/TP) can be interconnected directly using the same wireless Autonomic microrouters, simplifying the standard BACnet router infrastructure. In all cases, what forms is a highly reliable mesh network, dynamically and automatically, which routes data traffic around troubled areas when necessary, all without manual intervention, thereby providing a low-cost, plug-and-play, wireless building automation network. For a radio with 20 dBm transmission power and -80 dBm receive sensitivity, the link margin would allow the RF signals to penetrate a multiple of walls and floors. To reliably provide coverage of a larger building, however, an Autonomic mesh network architecture with multihop routing capability becomes imperative. As pointed out earlier, by use of multihop routing allows the RF signals to reach the very far ends of the floor and to cross multiple concrete floors. Diverse paths can be ensured such that a data route can switch from the failed one to a working one rapidly without losing user data (e.g. for Kiyon microrouters, at less than 100 milliseconds). Multipath fading in indoors environment may introduce additional loss of as much as 40dB. More radio nodes and larger number of hops may thus be required for a large building and where there exists strong multipath interference. Considering each RF signal can reach 50~100 feet reliably in distance (e.g. 802.11b) in a typical indoor environment, a 3~5-hop mesh network would provide reliable coverage for a small to mid-size building. For larger buildings, more hops (or intermediate microrouters) are needed. A network with a 10 or more hop distance between communicating peers is a practical usage scenario. Due to certain deficiencies in IEEE 802.11 or 802.15.4 medium access control (MAC) protocols, which many of the current ad hoc mesh network routing protocols are based upon, the effective end-to-end throughput of a multihop network system deteriorates rapidly as the network diameter increases, therefore limiting how large a wireless building automation network can actually scale up to. A practical solution to such problem lies in the Kiyon creation of spatial and channel diversity in the MAC protocol layer. A cross-layer protocol design approach encompassing the radio physical layer, MAC, ad hoc routing protocol and TCP over such dynamic wireless networks, guarantees the end-to-end performance for a large and practical sized network. As the Building Automation Industry continues to look for increasing value, technology continues to provide alternatives. Today's BAS systems have supplied us with an abundance of data. The end user wants ways to analyze the data and turn it into information. By embedding higher-level applications into building automation networks, the process of data mining can be greatly enhanced. The speed in which the information can be conveyed and analyzed is both faster and more reliable than conventional point-to-point wired or wireless systems. Mesh networks built on a broadband RF infrastructure, increases the value in the building by integrating many building systems. 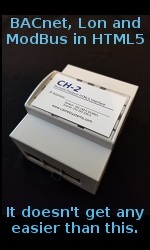 Data from HVAC, Security, Smoke, Fire, Power, RFID, and VoIP can be provided on the same network. This same network can also operate Wi-Fi cell phones, laptops, and PDAs. With the self-healing properties and two levels for built-in security such as Wi-Fi Protected Access (WPA) at the link layer and the Advanced Encryption Standard (AES) based solution at the network layer, Kiyon mesh networks are ready to deploy in both retrofit and new building applications. The first wireless applications were used in areas where wires could not be pulled. The wireless mesh technology has taken wireless to a new level in building automation. Let's explore some of the applications that can be embedded in the wireless mesh technology. First automatic installation and commissioning save the installer in two ways. Wires do not have to be pulled and the RF modules do not have to be commissioned. A network map can be overlaid on a building layout to monitor the health of the system from any laptop or PDA. Even though the system is self-healing, any problem will be brought to the attention of the building operator. The wireless user interface prevents the need to connect cables to a controller in order to update software or check the status. In addition to wireless sensors, the field controllers and supervisory controllers can go wireless by embedding the technology or connecting it through BACnet. The network can combine wireless and wired systems in the same building. For retrofit or new building applications, the wireless can be installed in part of the building while a wired system can operate the rest. Operating similar to GPS, the mesh network also provides Radio Frequency Identification or RFID. This can provide inventory control, Supply Chain Management (SCM) or equipment tracking by using RF tags. The system will be able to locate a PC, lost luggage or a million-dollar piece of portable equipment. Wireless cameras can be used for security, maintenance, or emergency conditions. Temporary smoke or fire sensors can provide safety for people working in part of a building when power is temporarily shut down. The mesh network can monitor the breakers on a power panel or control refrigeration units in a large department store. Voice over IP or VoIP could provide cost savings for phone users. Phones using the network could avoid costly phone bills. Finally, "over- the-air" software upgrades to equipment can be easily done through a wireless mesh architecture. These are only a few of the applications that can be greatly enhanced with the use of wireless building automation networks. It is not just wireless sensors any more, many additional applications will arise as this technology continues to deploy. Deploying cost-effective wireless solutions within the building automation industry as a wire-replacement running higher-level applications is now technologically and economically feasible. As innovations emerge and products become available, more and more wired communications will be replaced by wireless systems for building automation solutions, noticeably HVAC controllers, RFID readers, residential broadband and Internet free phone access. Weilin Wang - Weilin is VP Autonomic Networks of Kiyon and responsible for developing Kiyon�s autonomic networking technology. Prior to Kiyon, Weilin was with Graviton, a wireless sensory networking company in La Jolla, working on a multi-channel MAC design and development. He was chief network architect at Optical Micro-Machines and senior advisor at Nortel Networks before he relocated to San Diego in 2000. He has a number of patents in wireless networking and dynamic routing, and holds a master�s degree and a Ph.D. from New York University and City College of New York, respectively. Michael P. Nova MD - Michael is the Founder and CEO of Kiyon, developing Autonomic Networking technology for both industrial and consumer markets. Kiyon is venture and corporate backed by Smart Venture Partners, the Bond Development Corp. and others. Previously, Dr. Nova was Founder and President of three additional high-tech companies: Graviton, Discovery Partners, Inc. (Nasdaq: DPII) which completed a successful IPO and is developing wireless drug discovery technology and radiofrequency combinatorial chemistry; and Prizm, Inc (now Selective Genetics), which is developing targeted genomics therapeutics. John Edler - John is former Vice President of Engineering, Johnson Controls Inc, Controls Division. Responsible for world wide product engineering operations including product development, support, technology, strategic planning, and leadership for over 400 people. Currently, he is VP and General Manager, Building Automation, Kiyon Inc.